Aleksandra Janowska, Maksymilian Głowacki, Jaromir Hunia, and Albert Roethel have all received top prizes in nationwide science competitions. The achievements of ADAMED SmartUP participants are the best proof that the programme not only enables young people to broaden their interests, but also has an impact on their future careers in science. On 24th April, the results of the 46th National Biology Olympiad were announced. 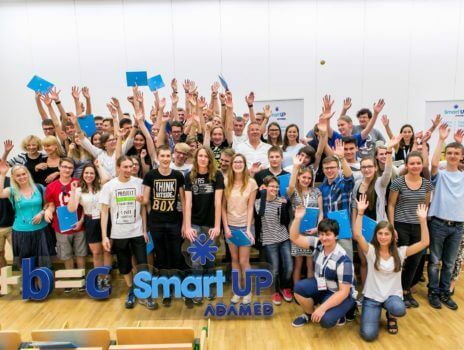 Jaromir Hunia, winner of the 2nd edition of the programme, got first place, while Albert Roethel, participant of the ADAMED SmartUP innovative science camp, came fourth. Both were awarded gold medals. As a result, they will be able to represent Poland in the international level of the contest. In addition, Aleksandra Janowska, holder of the scholarship from the programme’s 1st edition, won a silver medal for the seventh place. Meanwhile, Maksymilian achieved second place in the Chemistry Competition of the Warsaw University of Technology. This is yet another victory for both Jaromir and Aleksandra. Previously, Aleksandra had won numerous life sciences and mathematics competitions and successfully applied to study at the University of Oxford. Jaromir is the winner of competitions in biology, geography and Polish language organised by the Chief Education Office, and his project has qualified for the prestigious European Union Contest for Young Scientists — EUCYS. The scientific counselling offered to winners of the ADAMED SmartUP programme certainly came in useful in preparing for those competitions. Another scholarship holder’s participation in the 32nd Chemistry Competition of the Warsaw University of Technology was also a huge success. Maksymilian Głowacki from Warsaw came second in the competition, adding yet another achievement to his already impressive list. He is a two-time winner of the Chemistry Olympiad. Moreover, he can be proud or being the finalist of mathematics, physics and IT contests as well as taking first place in the preliminary stage of the European Youth Debating Competition. He used the support provided by the ADAMED SmartUP programme not only as a means of helping him prepare for the contests, but also to apply to universities. He successfully applied to Imperial College London and to University College London, and is now awaiting the results of his school-leaving exams. We extend our warmest congratulations to all the winners — may all your future academic plans come to fruition!